Hi all. I’m literally desperate to get the 100% completed challenges and I’m not above getting help! I’ve been on those two everyday for nearly a month and just cannot get them. Yeah I know your situation .. I completed every milestone in July but it was a looong and hard way. 2.) In GA with Maps where you have to fight against AT-ATs or MTTs, use the sniper class with also bounty hunter card and the NT-242 with ion shot and then always play the objective to get the points you need. Try to avoid maps like Takodana, Yavin, Kashyyyk, Endor and Deathstar. Those are too difficult for Boba. 4.) if you used your ability, fall back immediately and wait until your ability is ready again. Nice one. I appreciate the advice. I’ve also found using a heavy against AT-AT MTT with the Ion turret and explosive shot racks up a lot of points. It’s so frustrating! I got to the same stsge a few months ago, 99% completed and then they added in the new hero and trooper milestones for bp etc! and I dropped back down to 78%!!! I was gutted! But you guys are right, relax, keep playing GA and the last two milestones will come. No the Naboo Starfighter isn’t a Hero Ship, it’s a normal ship you can play if you get defeated as a hero, so no new milestones for this ship. But Grievous I guess will have 3 Milestones of dealing damage (Tier 1-3) and 3 milestones of Making kills with different abilities. I think you’re right. He’s going to be a fun hero to play. 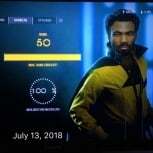 Oh yes, Lando is much fun!! Brilliant. Fantastic dodging. Exactly how I play and why I like Lando. There’s not many heroes that could take out Vader and Iden on their own! So how’s it going with your milestones? Any progress? Hey. No not as yet. I’m still enjoying it, but it’s very frustrating! Yesterday I’d got all my points setup to get Boba on Kamino stage 3 and suddenly our troops dropped like a stone and the game ended! In the next GA, I got Luke on stage 3 and was helping to defend a fuel pipe, pushed a group but it was four not five! I was gutted. Then I was quickly killed! Never mind, I’ll get them, just need to keep trying! I’m all for skill challenges etc, it’s frustrating when there’s so much luck involved, like the GA actually getting to the best stage. You’ve got no control over that. Do you think trying to get Bobas rocket barrage in HvV is an idea? Yes those ‘luck challenges‘ are very annoying. Like Tallie Lintras Milestone where you have to save your mates in SA who are under attack. Death Star is very recommendable! Hey. Good point, the heroes would have to be low on health as well! It’s helpful to see others do it so you know it can be done. Hey all. Good news. I just completed Lukes ‘Everyone needs a push’ challenge! It’s been weeks trying to get it, v proud of myself and a good example of hard work and sticking at something paying off! I got it on Jakku, third stage defending the west exit (at the door way where the First Order is trying to get through). Just one challenge left to get 100%. Cheers man. I’m going to try and try around a bit more as Boba, like in your video, and try for group kills. I tend to fire from ground level where everyone can seem you (and shoot you!). Do I have to prerecord it, you can look at something you’ve done previously? So once I’ve got Boba, get recording? Yeah I realised after I clicked on the link!